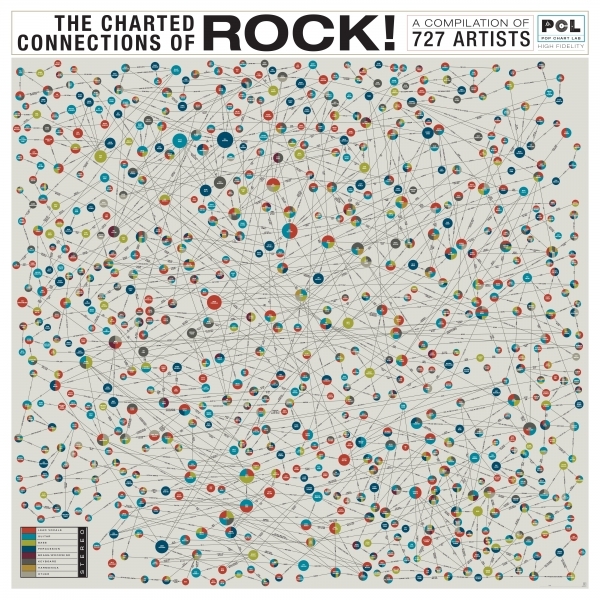 Pop Chart Lab has created this illustration that takes a look at the connections between 727 of the biggest names in rock music. Tune up with this colorful chart of colorful chart-toppers, featuring the complex concatenations between over 700 artists and 500 bands throughout music history. Whether those collaborations turned out to be melodious milestones (Hall and Oates, Page and Plant) or euphonic footnotes (Rod Stewart and Kinks frontman Ray Davies), this diatonic diagram diligently denotes degrees of separation across genres and generations of musicians--all at a staggering 39" x 39", an LP-sleeve-shaped musical mammoth of a chart.